This simple meal makes a nice everyday dinner, perfect for any busy weekday or weekend. The andouille sausage is spicy and wonderful, but feel free to use different smoked sausages, such as kielbasa or seasoned chicken sausage. Cajun or Creole seasoning adds flavor to the roasted vegetables, but this dish could also be made with another seasoning salt blend. Serve with freshly baked biscuits or rolls and a simple salad for a complete and satisfying family dinner. Heat oven to 425 F. Grease a 3-quart baking dish or spray with nonstick cooking spray. 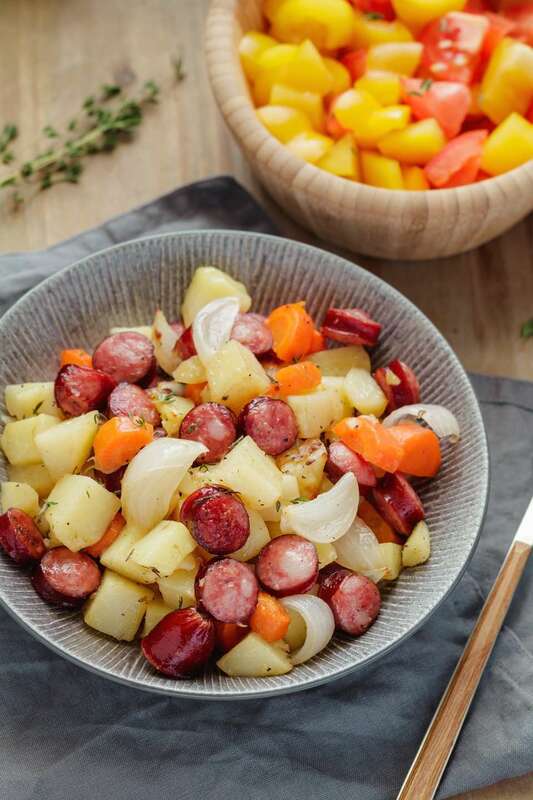 Combine the sausage pieces, chunks of potatoes, carrots, and onions in a large food storage bag or bowl. Toss with the pepper, salt, Creole seasoning, garlic, thyme, and olive oil. Roast for 45 to 60 minutes, until vegetables are fork-tender, stirring every 15 to 20 minutes. Serve with a salad and biscuits for a complete, delicious meal. Some Cajun and Creole seasoning blends are unsalted; make sure to taste and add salt, to taste. Use diced leftover ham instead of sausage in the dish. Make the dish with browned fresh bulk sausage—chorizo, breakfast sausage, or mild Italian sausage. Add sauteed sliced mushrooms to the mixture. Replace some of the carrots with sweet potato cubes or butternut squash cubes to the mixture with the potatoes. Add a cup of halved brussels sprouts to the potatoes. To lower the carbs, replace the potatoes with chunks of cauliflower and omit the carrots or slice them thinly or julienne. Roast for about 30 minutes, or until the vegetables are tender. After about 40 minutes of roasting, toss the vegetables with about 1/2 cup of grated Parmesan cheese. Return the dish to the oven and continue roasting for 15 minutes, or until the vegetables are tender and the cheese has browned. Add a few sprigs of fresh rosemary and/or parsley to the vegetables along with the fresh or dried thyme.